Hatter Street Cafe is a pretty small cafe. I was expecting a more whimsical space- a pity really since their theme has lots of potential. What attracted me was their waffles with pandan ice cream and gula melaka sauce. Couldn’t stop raving after it landed on the table. From fork to mouth it was fabulous. The buttery smell, crispy browned exterior, light interior, eggy flavour. I can go on and on. For me, this is probably the best waffle to date. 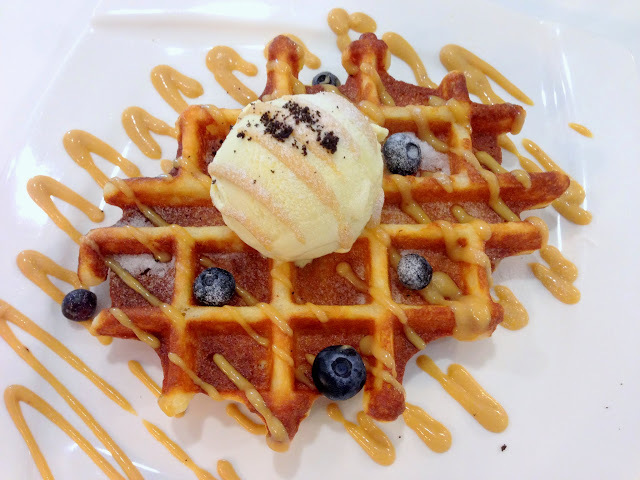 The friend said our waffle was crispier than usual- yay for us! Unlike creamier’s waffles I think flavour-wise this is eggier, and texture-wise it’s heavier, tending towards a liege waffle. That pandan ice cream was also so scrumptious. It was a little sticky like gelato but the mild fragrance of pandan was there. The gula melaka sauce fit this south-east asian flavour profile perfectly, like how butterscotch sauce is to vanilla ice cream.